You are here: HOME > NEWS > Why First Aid is a life skill everyone should learn. For one young Cadet it helped make the difference between life and death. For Cdt Daniel Padgett it had been like any other Sunday. He was spending the day with his friend and they had decided to go to a park in Cranham, Upminster. They had just walked along Front lane with his friend Bailey Ward and his Dad. When Baileys Dad suddenly said he felt unwell. 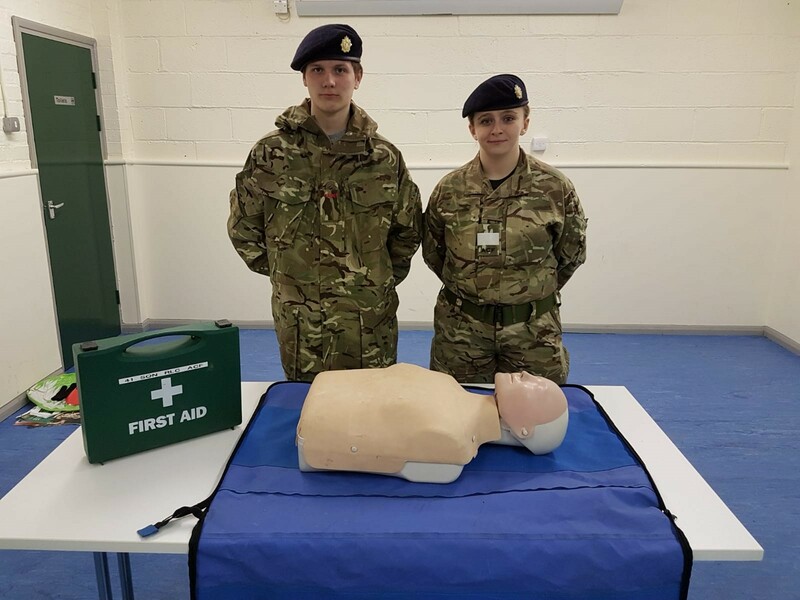 Both boys were worried but Cdt Padgett remembered his first aid lesson earlier that week with Sergeant Instructor Chloe Gale. As the Dad began to collapse they helped him lean against the nearest building and as things became worse Cdt Padgett kept the situation calm and reassured his friend. Keeping calm this 15 year old cadet lowered the gentleman to the ground and then put him into the recovery position. Remembering his first aid and his DR ABC he did all the checks and began to gather information to give to the ambulance service. He dialled 999 and explained what had happened however the 999 operator confirmed it would be a 30 minute wait. As time went on Cdt Padgett was concerned that the man had experienced a stroke from the symptoms being displayed and again he remembered the things he had been taught about F.A.S.T. Cdt Padgett asked an adult nearby to call the ambulance again and say it was a suspected stroke. The ambulance service arrived within a few minutes and Cdt Padgett handed his casualty over. During the short wait for the ambulance he made sure they had all the details needed so they could act fast to save the man’s life. The man had a further stroke in the ambulance and was treated in hospital for a few days and was then released home to recover. When Cdt Padgett spoke to his Detachment Commander Chloe Gale the following week. He told her what had happened and wanted to thank her for teaching him the first aid the previous week at the unit in Wood Lane, Dagenham. Lisa Padgett, Daniels Mum said that Daniel had wanted to join Cadets when he was younger, he finally decided that it was the right time for him to give it ago. She explained that he had come home from each parade night explaining the new things he had learnt but she never dreamed he would put them into practice. Cadets like Daniel are trained by adult volunteers that receive training to become instructors. The Army Cadets offers so many opportunities and bring together friendship for all. You don’t need to have any military background just a desire to make a difference.